The Chancellor's Award—A cash award of $1,000 is presented annually to a high ranking graduating student who has done the most to promote the health sciences and the School before the public. Selection is made by a committee of the faculty appointed by the Dean, with consultation by members of the graduating class. This award was established by the Chancellor of the Medical Center in 1977. The Dean's Award—This award of an engraved plaque and a cash honorarium is given to the senior medical student who has demonstrated excellence in leadership qualities and who, in the opinion of a committee of the faculty, offers the most potential for future leadership in the medical profession. This award was developed by the Dean of the School of Medicine and was given for the first time in 1978. The Medical Alumni Association Osler Award—A cash award of $250, a framed award certificate, and a bronze Medal are awarded to the graduating senior student, who in the opinion of the student's peer group, shows intellectual acumen, compassionate patient care, outstanding relationships with fellow students, integrity, and who is believed to have outstanding potential to become a superb clinician, continuing the finest traditions of humanitarian medical practice. The Gerald R. Gehringer Award—This award is presented to a graduating senior who has demonstrated outstanding scholarship and leadership and a proven commitment to a family practice career. The award consists of an appropriately inscribed plaque and a cash honorarium. This recipient is selected by a committee of the Louisiana Academy of Family Physicians. The Harry Emerson Dascomb Award in Infectious Diseases—This award, consisting of a cash prize of $250 as well as a framed certificate, is presented to the Senior student who demonstrates the most outstanding performance on the infectious disease consultation service. An engraved plaque with the name of each year's recipient will remain in the Department of Medicine. The creation of this award is in honor of Dr. Dascomb for his outstanding clinical, leadership, and personal qualities during his years as chief of the Section of Infectious Diseases. The Henry W. Jolly Jr. Award in Dermatology—This award, consisting of a plaque, and a check is given to an outstanding graduating senior student in Dermatology, who exemplifies the potential qualities of a good physician and dermatologist. The award is in appreciation of and recognition of the outstanding contributions of Dr. Henry W. Jolly, Jr., former head of the Dermatology Department (July, 1974-1985) to the field of Dermatology and to the teaching of medical students and residents. The Faculty of the Department of Dermatology selects the recipient. 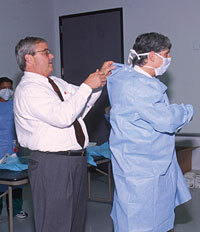 The American College of Physicians Internal Medicine Award of Excellence— Established in 1993 by the Louisiana Chapter of the American College of Physicians, this award is presented annually to the graduating senior from each of Louisana's three medical schools who most represents the ideas of the internal medicine specialty. The recipient is chosen by the Department of Medicine, with input from the internal medicine housestaff, and is honored with a plaque and a cash award of $500.00. The Kornberg Award in Biochemistry—This award is presented as an engraved plaque to a Senior student for outstanding performance in medical biochemistry. The recipient is chosen by the faculty of the Department of Biochemistry and Molecular Biology and is presented as an engraved plaque and a cash award of $100. The Physiology Award—This award is given to a graduating senior student who has achieved academic excellence in physiology and has performed research and/or provided service to the Department of Physiology during the years enrolled in medical school. The award consists of a gift certificate and an engraved plaque. The Pharmacology Award—This award consists of cash and a plaque and is presented to the graduating senior who has demonstrated academic excellence as well as excellence in research and service in the area of pharmacology. The Department chooses the recipient of this award. The Herbert Rothschild Award—The award was established by the Greater New Orleans Pediatric Society and the Department of Pediatrics to recognize an outstanding graduating senior in the field of Pediatrics at Louisiana State University School of Medicine in New Orleans. This award honors Dr. Rothschild who, for over 50 years, practiced Pediatrics in New Orleans. Following his distinguished career as a practicing physician, Dr. Rothschild joined the full-time faculty of the Department of Pediatrics to teach and guide students and residents in the care of children. The award consists of a plaque, certificate and a cash award. This award is presented annually at the May meeting of the Greater New Orleans Pediatrics Society. The student is also recognized at the Pre-commencement exercises. The Stephen Osofsky Memorial Award—The award, consisting of a plaque and a gift certificate to the Medical Center Bookstore, was established in memory of Dr. Stephen Osofsky by the Department of Pediatrics of Louisiana State University Medical School at New Orleans to recognize the outstanding Acting Intern in Pediatrics. Dr. Stephen Osofsky was Medical Director of Children’s Hospital from 1982-1986. He was a consummate pediatrician and educator deeply concerned about resident and student education. The Bick Scholarship Award in Psychiatry—This is a cash award in the amount of $200 presented annually on behalf of the Louisiana Psychiatric Association to the Senior student who has been designated by the Department of Psychiatry as having shown outstanding interest and achievement in this area of medicine. The Gate-Mickal Award in Obstetrics and Gynecology—This award, consisting of a certificate and a check for $300, is presented to the graduating Senior student designated by the Department of Obstetrics and Gynecology, who has demonstrated academic excellence and outstanding interest in that area. The Gate Pharmaceutical Company of Sellersville, Pa., and the LSU Obstetrics and Gynecology Alumni Association co-sponsor the award, honoring Dr. Abe Mickal, former head of the Department. The Orthopaedic Award—This award is made by the Louisiana Orthopaedic Association to a Senior student. The student is selected from those who submit a paper relative to an orthopaedic problem and for outstanding performance in orthopaedic surgery. The recipient is selected by a committee of the Association. The award consists of a check for $100 and recognition at the annual meeting of the Association. Papers are to be submitted to the Department of Orthopaedics. The Janet M. Glasgow Awards—The awards, consisting of certificates of merit, are presented to the women graduates who are top scholars in their class. The awards focus attention on the accomplishments of women in medicine and are sponsored by the American Medical Women's Association. Selection is made by a committee of the faculty. The Upjohn Award for Excellence in Clinical Years of Study—This award is presented to the graduating senior who has been chosen by the selection committee as having demonstrated excellence in the clinical years of study. In addition to scholarship, consideration is given to factors such as personality and evidence that the student has potential to become an excellent clinician. This award is provided by the Upjohn Company of Kalamazoo, Mich. It consists of an engraved plaque and a check in the amount of $150. The Family Physician Award—The award is presented by the Louisiana Academy of Family Physicians Auxiliary. A plaque bearing the inscription of the ``Oath of Hippocrates'' is presented annually to the graduating senior who has best demonstrated family physician qualities of ``Care with Caring'' for patients and their families and who has shown evidence of choosing family practice as a career. The Adamo Memorial Award in Neural Sciences—This award of $300 is given to a member of the Senior class for excellence in the neural sciences. It is given in memory of the late Dr. Norma Jean Adamo, an Associate Professor of Anatomy, who was a devoted neuroscience teacher and researcher. The recipient is selected by the faculty of the neural science programs. The George S. Bel Memorial Award—A cash award of $500 presented annually to a high ranking Senior who is considered to ``represent the highest ideals of medicine.'' Selection is made by a committee from the faculty appointed by the Dean with participation of the members of the Senior class. The prize was established during the 1939-40 session by the late Mrs. George S. Bel as a memorial to her late husband, who had been professor of medicine and head of the Department from the founding of the School until his death in 1939. The Russell L. Holman Memorial Award—This award is made by the Louisiana Pathology Society in memory of Dr. Russell L. Holman, an outstanding pathologist who served as head of the Department of Pathology from 1946 until his death in 1960. The award is presented to the Senior student in the graduating class who has demonstrated unusual ability and interest as well as basic scholarship in the fields of clinical pathology, forensic pathology, or pathologic anatomy. A committee derived from members of the Louisiana Pathology Society and the Department of Pathology selects the recipient of a cash award and a plaque. The Carl F. Tucker Memorial Pathology Award—This award is made in memory of Dr. Carl F. Tucker, an LSU graduate and distinguished pathologist, from a fund created by members of his family and colleagues. The award is presented during the junior year to that student who demonstrated the highest proficiency in pathology during the sophomore year, and has a demonstrated interest in clinical medicine and research. The Hull-Akenhead Memorial Award—In honor of the late Dr. Edgar Hull and the late Dr. Walton R. Akenhead an award is made to the graduating Senior student with outstanding academic accomplishments related to cardiovascular disease. The award will be based on performance during the Junior Medicine Clerkship, Senior Cardiology Elective, and research conducted during the four years of medical school. Nominations are made from basic science departments, selected clinical departments, and the Senior class. The award is made by the Section of Cardiology of the Department of Medicine. The Nicole Melissa Munn Memorial Award in Pediatric Neurology—This cash award, made possible by the family of Nicole Melissa Munn is given to the graduating Senior student who has demonstrated superior medical knowledge throughout the four years of medical school, is oriented toward patient care, completed a Pediatric Neurology elective in the senior year, demonstrated medical competence in clinical situations and demonstrated exceptional human relations skills in clinical situations. A committee of faculty and house staff from the Departments of Pediatrics and Neurology select the recipient. The Luis Perez Memorial Award in Ophthalmology—This award is given to that graduating Senior student who exhibits both academic excellence and clinical growth during the fourth year curriculum. The recipient is chosen by the faculty of the Department of Ophthalmology. The award consists of current books in the field of ophthalmology. The Urban Maes Memorial Award—A cash award is presented annually to the Senior student who, in the opinion of the surgical staff, has shown the greatest promise for future accomplishment in the field of clinical surgery. This award is given in honor of Dr. Urban Maes, who served as head of the Department of Surgery for fifteen years. In 1947, he was named professor emeritus and served in this capacity until his death in 1954. The award is provided by friends of Dr. Maes. The G. John Buddingh Memorial Microbiology Award—In honor of the late Dr. Buddingh, a pioneer researcher in virology and internationally respected infectious disease clinician, who was head of the Department of Microbiology and Immunology from 1946 until his retirement in 1971. This is an annual presentation to the Senior medical student who demonstrates outstanding scholarship, interest and ability in the general areas of medical microbiology and immunology. The award, $150 in cash and a suitably engraved plaque, is provided by friends of Dr. Buddingh. A committee representing the Department of Microbiology, Immunology and Parasitology, as well as adjunct faculty select the recipient. The Peter Graffagnino Memorial Award—This award of $500 was established in 1986 by the family of the late Dr. Peter Graffagnino, a member of the faculty in obstetrics and gynecology from 1931 to 1951, the latter eleven years as professor and head of the Department. The award is presented to the graduating Senior student who had to work the hardest and had to overcome the most obstacles in achieving the doctor of medicine degree, thus epitomizing the life of Dr. Graffagnino. Selection of this award is made by a committee of the faculty.